The citations refer to the previous two interview posts. Miami is the first one with David Fitzgerald; Logicast is Daniel’s follow up podcast. The time references match the preceding time marker in each of the two posts. So [Logicast, 49:00] means that the source for my statement can be found by beginning to read from the 49:00 minute header in Daniel’s followup podcast post. Daniel Gullotta is a young student (26 years old, just starting a Masters course at Yale) who is looking forward to breaking into the field of biblical studies as a professional scholar [Logicast 49:00, Miami 72:40 and blog bio]. The field is winding back in many universities but Daniel is doing all the right things — especially with his self-promotion via his blog and other social media [Logicast, 29:00, 1:29:30] — to improve his chances of eventual employment. All credit to him and we wish him well as we do anyone embarking on a new career. What I would like to do in this post is to raise some of the dynamics — psychological and social — that I noticed at work in the recent exchanges I recently posted here. What interested me as I wrote up my notes on these two exchanges was not so much the arguments themselves — they were at a very basic level and sometimes misinformed — but the way the issues were framed and what the flow of conversation revealed about the different perspectives at play. In other words, what is really going on when challenges to mythicism are raised and when there are discussions between mythicists and historicists? What is it that lies behind the arguments themselves and that perhaps indicates why arguments on neither side “work”? It’s a question I could explore more widely by examining a wide range of exchanges and denunciations but I also have to invest in a full time job so that’s not going to happen today. I am, however, revising the many comments on the old Crosstalk discussion forum where Earl Doherty made his first public appearance in the world of scholarly exchanges and would like to share a similar set of observations from those exchanges one day. Till then, we start with a very small case-study based on one “budding scholar” in two online interviews. Daniel is careful to emphasize his “budding” status, “I’m not there yet”, he reminds us [Logicast, 18:00]. He’s still learning and working towards his higher degrees. He looks up at the books on his shelf and tells us he is awed by the lofty reputations of their authors’ names. They stare down upon him “intimidatingly” [Logicast, 7:10]. The field of biblical studies is clearly where he sees his future. Daniel does not identify with the conservative or fundamentalist side of this scholarly field although he does acknowledge some very good work that must be engaged emanating from that wing [Logicast, 7:10]. He is excited by the current and future state of historical Jesus studies as old methods (form criticism; criteria of authenticity) are being challenged and new ones being tested (Dunn, Crossley, Keith, Le Donne) [Miami, 64:30; Logicast, 1:4:00]. Daniel’s studies as an undergraduate began at the University of Newcastle (Australia); he undertook a theology degree specialising in biblical studies. [Miami, 3:30; Logicast 29:00, but see Daniel’s blog bio for more details]. It was there that he first encountered the idea that Jesus did not exist. It was part of the documentary movie Zeitgeist that was popular at the time [Miami, 3:30] — a film sensationalising conspiracy theories, the paranormal, etc. His younger brother not long afterwards ignited his curiosity over the idea that anyone could seriously doubt the historical existence of Jesus. In the same year (2012 — when Daniel was 22 or 23?) Bart Ehrman’s response to mythicism, Did Jesus Exist? was published [Miami, 3:30] and Daniel appears to have been aware of Richard Carrier’s blunt response to this book. Since then Daniel has read Carrier’s On the Historicity of Jesus [Logicast 1:27:30]. and then picked up in the Soviet Union. then it reappears in the ’70s and ’80s in the New Age form. and now it has re-emerged in the atheist sceptic community. What we find here is a person whose future career and deep personal interest is identified with the mainstream academic world of theology and biblical studies. His introduction to mythicism is in this context and the concept itself first meets him as part of a program highlighting bizarre and paranormal phenomena and then through a highly respected and prominent mainstream scholar who himself frames mythicism as a bizarre idea without any serious credibility, most of whose advocates lack relevant scholarly qualifications. The one scholar sympathetic to mythicism who responded publicly to Ehrman’s book is not employed in the same academy as Ehrman and in which Daniel is involved. Yet Carrier exposed Ehrman’s incompetence and his less than professionally honest treatment of the mythicist publications so bluntly that Ehrman has since refused to engage with Carrier at all. Anyone not familiar with the mythicist arguments (apart from hearing of them in the context of Zeitgeist) and who learned of them through a well respected and prominent representative of the mainstream academy with which one personally identified, is naturally going to wonder about why such an idea gains any traction and momentum at all. One can understand why the reception of this idea is of more interest than the “bizarre details” of the arguments themselves. In fact the arguments in such a context would be of interest for their “bizarre” nature and for addressing the question of “why does anyone ‘out there’ believe this stuff?” What is of interest is why it is that people who are “out there” — who set themselves quite outside the established scholarly community — take on such an unconventional idea rejected by serious scholars. Moreover, the one scholarly (but an independent scholarly) voice who does respond to Bart Ehrman dares to bluntly say something unthinkable — that Ehrman’s scholarly skills and professionalism have deserted him in his critique of mythicism. It does not take long for such a new “budding scholar” to hear of the intemperate insults and abusive language coming from supporters of a well web-publicized “New Age” type of mythicism, Acharya S or D.M. Murdock who supports the religion portion of the Zeitgeist movie. Anyone who has dared to criticize Acharya’s work knows that they must expect to be met with personal and abusive attacks from her supporters. Her works do argue that dark conspiracies within the early Church covered up the mythical origin of Jesus. This has also been a time of the outspoken New Atheists and their apocalyptic “Four Horsemen” — Dawkins, Hitchens, Harris and Dennett. Hitchens and Dawkins additionally expressed some openness to the possibility that Jesus himself was a myth. But their knowledge of religious studies has not been strong and religion scholars have commented on this lack. Their zeal and colourful eloquence in attacking religion has not always been tempered with more nuanced understandings of religion’s character and functions that have been derived from modern fields of psychology, sociology and anthropology, let alone biblical studies. Everything green is within the realms of respectable establishment scholarly biblical studies. Everything not in green is associated in some way with a mythicist idea. 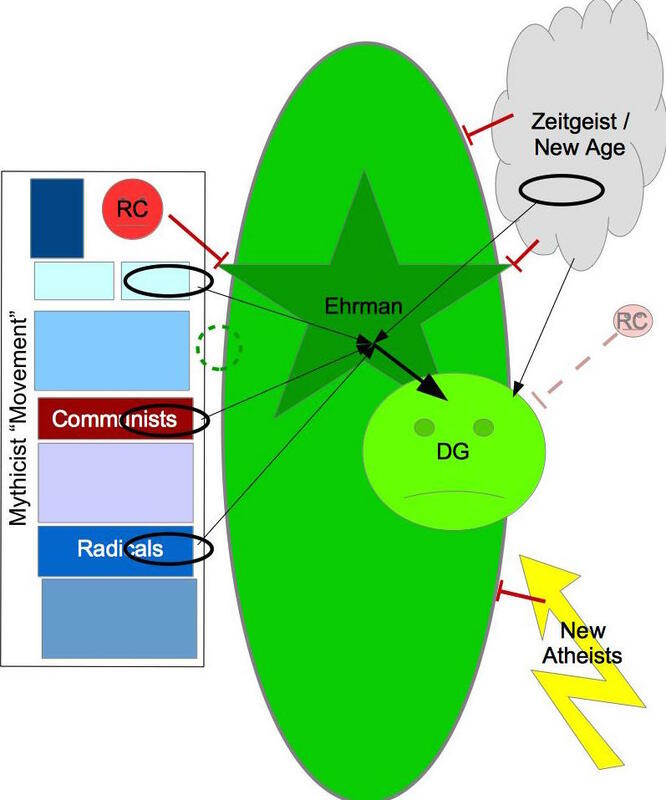 The dark green star shaped is labeled Ehrman for convenience. It would be just as valid to add here other prominent names within mainstream biblical studies who have been influentially outspoken against mythicism. This star is the channel through which DG has been introduced to “the reception history” of mythicism. Notice that only a few aspects of the mythicist movement are singled out, especially those associated with “Dutch radicalism” and “Soviet communism”. This reception history is blended with mythicist associations found in the Zeitgeist/New Age movement. The Mythicist Movement on the left represents the long line of scholarly works by various persons from the eighteenth century up to the present time. By “scholarly” I mean works that follow the normative methods of scholarly inquiry; authors are very often scholars in fields outside the area of mainstream Christian/Theology/Biblical studies; sometimes they are serious amateurs who have acquainted themselves with a wide range of scholarly research. They are a mix of atheists and and various types of religious/spiritual believers, although probably most have been atheists and agnostics. Richard Carrier appears twice: on the right he is a shadowy fear DG is “terrified” of facing in the future [Logicast, 1:27:30]. The dashed green loop joining the mainstream biblical studies area with the mythicist movement box represents mainstream the handful of mainstream scholars who have publicly expressed an open mindedness on the mythicist question. The Zeitgeist/New Age movement of more recent provenance also embraces mythicist ideas but few would consider their methods to be “scholarly”. The same methods tend to underlie arguments for paranormal and occult phenomena, conspiracy theories, and overall they tend to adopt a strongly hostile stance towards mainstream religions. The dominant mythicist strand in this movement is astrotheology. DG was introduced to this mythicist idea independently when an undergraduate student. There are two groups who are vocal in their antipathy towards the green area of mainstream religion, Zeitgeist/New Age and the New Atheists. Richard Carrier has also confronted Ehrman (and others represented by the star) and DG is fearing a similar confrontation from RC in the future. The astrotheology movement has also confronted Ehrman personally. There is a distinct difference from RC’s confrontation with respect to the specifics targeted and the extent of personal abuse. It is doubtful, though, that those differences have been registered by the one (Ehrman, e.g.) whose professionalism has been challenged. 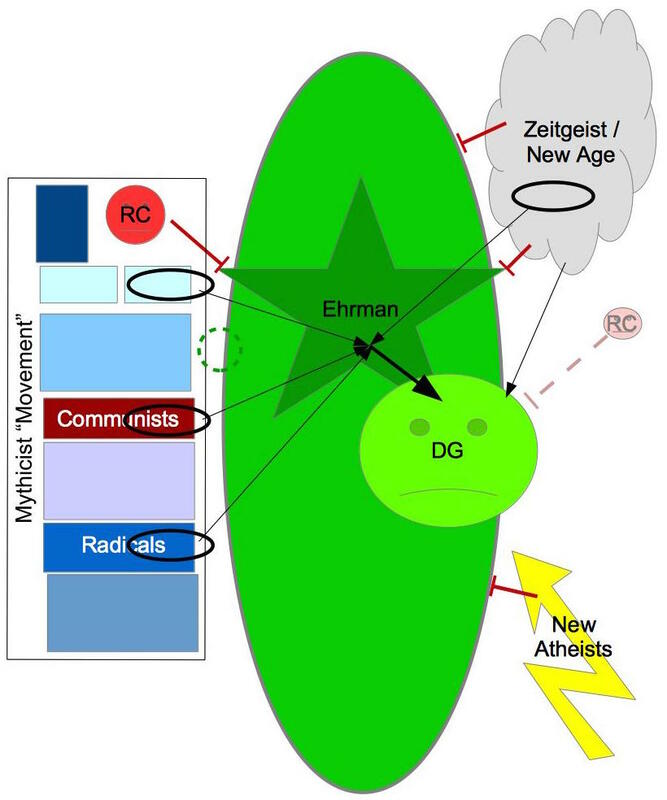 When seeing the channels through which mythicism has been introduced to Daniel, it is not difficult to understand why he (or for that matter most persons in green) default to a jaundiced view of the actual arguments for mythicism and would be more curious about its reception in the wider non-green community. This model would lead us to predict certain responses to mythicism. We would expect to find the debate framed as a contest for group power and prestige. We would expect that Daniel would look to the more mature “green persons” for the appropriate responses to what is seen as a challenge from mostly ill-informed outsiders who, among their range of complaints against the world supported by the religious studies arena, assert Jesus was or was probably a mythical person. We would expect him to identify with the “research” and responses of Ehrman. There will no doubt be some room for differences here and there because one of the essential hallmarks of a good scholar (even a budding “green” one) is to demonstrate some intelligent independence and creativity in one’s contribution to “the world of green”. And the more one reads of the mythicist works themselves the more scope one will inevitably find to disagree with Ehrman (and other “green star” persons). Yet whatever differences of details one would predict support for the overall position of Ehrman nonetheless. We see that Daniel has already identified with Erhman’s position as one under personal attack from these mythicists as noted by his expressed fear of how Carrier is going to respond to his review of his book. We would expect that in the future Daniel will venture to read some other mythicist literature directly for himself, but it would be read from the perspective of trying to “understand what these outsiders think and why”. The arguments would not be studied and explored in the manner arguments from within the “green scholars” or ideologically sympathetic and supportive outsiders but would be scrutinised as “other data”, “other beliefs” as belonging to a cultural other that needs to be explained and studied as an anthropologist would study and report on the beliefs of a remote primitive tribe. We would expect Daniel to defend the views and methods of “the green” and to express personal identification with these views and methods “against” any and all forms of mythicism. We would expect Daniel to have only sufficient knowledge of mythicist arguments that will provide him with material with which to leverage an explanation of how his own scholarly world “really works” and why it is the respected authority and establishment. We would expect him to read/hear mythicist arguments as far as they can be rebutted by the routine “green” answers. There will be little to no interest in exploring them further and if the arguments are indeed deeper than to be demolished by the routine answers this fact will remain obscured. We would expect him to take special notice of any tone or manner expressed by a mythicist that can be interpreted negatively and any negative interpretation or impression will be magnified by anything that might have been intended by “the other”. We would expect to find a deploring of arrogance of those who challenge the established scholarly academy and at some level at least an implied, if not overt, belittling of the skills, characters and motivations of mythicists. The more conscious Daniel is of scholarly standards of communication the more likely this belittling will be implied. But one will expect to see evidence that the complaints against the attitudes or behaviours of mythicists (which will often be exaggerated from the perspective of outsiders) are not complaints about poor standards per se, but are restricted to the poor behaviours of mythicists only. The same or worse behaviours expressed by “men and women in green” and their supporters towards mythicists will either be completely unnoticed or generally excused or rarely if ever censured. In other words, we would expect to find the debate is framed as a contest for group power and prestige. And indeed these predictions are all fulfilled in the two interviews. . . .
First of all notice the way the two groups are quite artificially delineated. One is associated with positive characteristics and the other with negative ones. The biblical academy is presented as a healthy mix of atheists, agnostics, Christians, Jews so as to present a public face of “objectivity” and where ideology would never get in the way of genuine scholarship. Notably the atheists in the academy are definitely not anti-religion! DF’s comment was that he only pays attention to secular historians because Christians are circling wagons and I took umbrage to that. My bookshelf — “I look at all the names staring down at me very intimidatingly” — I don’t know what most of them do on a Sunday morning. . . . .
DG: Some go to synagogues earlier in week. “This isn’t just a field divided by atheists and Christians. There’s also Jewish voices and there’s also people you wouldn’t know if they were atheist or Christian. “When I look at my bookshelf I see a lot of names and I honestly don’t know what a lot of these scholars believe [philosophically]. What I care about is good history. And some of them [I don’t know] what they believe. I’m also friends with them on social media, so I get a sense of what these scholars do on a Sunday or don’t do rather. At the same time the reality — that one ideology does indeed dominate — is also undeniable. There’s plenty of people I know for a fact are religious and they are doing wonderful work.” e.g. Chris Tilling [says Thiering but pretty sure he means Tilling] and his new book Paul’s Divine Christology; Larry Hurtado; N.T. Wright — “is such a powerful voice in NT scholarship that he needs to be engaged with” despite disagreements with him. We need to acknowledge that there are many wings of scholarship like many denominations of Christianity. My favourite HJ scholar is a Roman Catholic. . . The other group, the mythicists, is just as artificially defined. Moreover, atheists are depicted as “anti-religious”, that is, with a hostile agenda against religion. While the above group with which Daniel identifies and to which he further aspires has good properties, the mythicist group has negative ones. Mythicism will always be on fringes because it lacks (I’m sorry but with respect) explanatory power. This podcast is a good example of why some people are so concerned. It is so entrenched in the atheist movement. One can’t differ the philosophy of one from the scholarship of another. It is only being entertained by atheists, podcasts, talk shows. Atheism has done itself a disservice by being so fascinated by this idea. Although it is an interesting topic. So if some in the next generation do flirt with it they need to stop self-publishing and stop podcasting like this and go to conferences and get in peer review journals and write respectable books and engage with peers well before the lay people get involved. Nonreligious atheists, agnostics, sceptics tend to view biblical studies as Christianity as a whole being against the rest of us free-thinking, rational people. But that’s not how the field is framed. and now it [the mythicist movement] has re-emerged in the atheist sceptic community. To see just how artificial this depiction of “the other” is browse through the current “Who’s Who” page. And that does not even begin to address the historical mythicists(e.g. Couchoud) who have been no more anti-religion than Goulder or Casey. Notice that Daniel further conceptualises the mythicist arguments themselves as all being derived from their “group” just as historical Jesus models are products of the academic group. DG: Ironically there is a lack of consensus (among mythicists). On my website I break them down. They have the fictional Jesus, the conspiracy theory Jesus (Atwill), the celestial Jesus (the most popular one amongst atheists — first by Doherty and then picked up by Carrier). On Daniel’s blog we find a discussion of four mythicist theories as if they are all products of a “group” in the same sense that the many views of the historical Jesus are the outputs of a single scholarly “group” or academy. That is, the divergent mythicist theories are collated and viewed from the perspective that they all derive from the same set of assumptions and attitudes that characterise the “other” or the “outsider”. This perspective coheres with the above quoted interview statement that speaks of a common characteristic of “mythicism in all its forms”. The identification of mythicists as “a group” is found throughout both interviews and appears in most cases wherever Daniel speaks of “mythicists” collectively to attribute to them a form of behaviour or attitude or scholarly acumen. Mythicism will always be on fringes because it lacks (I’m sorry but with respect) explanatory power. . . . .
. . . .What troubles me is someone like Carrier writing one book and then going to all these conferences and then going to the lay people — there’s a problem there. Daniel, of course, appears on podcasts, as do many other establishment biblical scholars. So what decides when the behaviour is bad is not the behaviour itself but who is actually doing it. It is bad for a group with negative properties to do what the positively characterised group does. What I find is that mythicists are not immersed in the scholarship. But this is lay people generally. Contrast this with other quotations already supplied in the other sections that address the contrast of Daniel’s engagement with the scholarship. The same Logicast podcast is stained with expletives and emotive attacks on atheists and mythicists that I don’t need to repeat here. Daniel appeared to be quite comfortable with these interviewers and expressed a hope to return. This sits well with Daniel’s other remarks on Ehrman’s attacks on mythicism insofar as he seems to be unable to recognise the “bad behaviour” and insulting abuse coming from such a leading representative of the group to which he aspires to belong. I think it’s important to establish what HJ scholars do …and something I find quite frustrating when talking to lay people or mythicists in this discussion is that they seem to equate the HJ with the Christ of faith — a lot of people conflate the two. Of course anyone who has seriously engaged with mythicist literature (not from the Zeitgeist side, though) knows how very conscious the authors are of the mainstream scholarly studies and the clear differentiation between the Christ of faith and the historical Jesus as reconstructed by scholars. I’m not really done with mythicism. The reason I say I’m done is that I’m done trying to convince mythicists they are wrong. If someone asks me what scholars think I’ll discuss, but I’m done trying to tell mythicists they’re wrong. I’m not going to waste my time trying to convince mythicists they are wrong. David realises I am not the enemy and I know he’s not the enemy. And the fact that this topic is framed in those ways is problematic. It is not my purpose to address the arguments offered by Daniel for the historicity of Jesus in the podcasts. What I’m looking at here is the way the exchanges have been framed. So it is interesting that despite this framing Daniel still did not see David as “the enemy”. One would like to think that eventually, had the conversation been without time limit, a much deeper understanding of David’s perspective would have been reached. The reality is, however, that full time study, especially at postgrad level, leaves precious little time. Daniel has even been advised to cease blogging while at Yale and he has complied with that request. Academics, especially young aspiring ones, are extremely busy people. They have scant time for topics outside their immediate professional interests. They have less motivation to pursue interests that stand contrary to the ideological foundations of their professional identities. I take quite seriously even works considered eccentric by the (often dull) mainstream of conventional scholarship. It is only by taking such books seriously, rather than offering facile mockery and disdain, that one can tell the difference between nonsense and brilliant new theories. But I have no wish to defend nonsense, and my book’s title pretty well indicates that I find a good bit of it in several of the books I review. And, again, it is my job to show why they are nonsense if indeed they are. . . . But Price could do more to inform his readers of the logical and methodological flaws in Acharya’s work and Daniel is at least partly right in his criticism of Price’s position towards astrotheology. It is a mistake for mythicists to think that they somehow need to “stand together” against the academy. That way can only lead to a deepening of the divide that currently exists and that I have attempted to demonstrate above. Carrier is right when he demands scholarly integrity come what may — whether it be towards mainstream scholars or prominent mythicists outside the guild. Carrier is also “right” when he is seen engaging in debates and discussions online because then he comes across much more the way David Fitzgerald came across when in discussion with Daniel on Miami Valley Skeptics — as someone who is “not the enemy”. Carrier is also right when he calls a spade a spade and confronts the unprofessional conduct of other scholars, but he is not right when he sometimes goes one step too far and uses insulting language in public discourse. I know. I learned from experience. I have expressed regret for the very few times I did resort to facetious or satirical insults in the past. One does have a breaking point but if one let’s it show publicly then one loses publicly. Those one or two times I failed were thrown back at me years later. By avoiding repaying kind with kind I know I won public support when “enemies” like McGrath and Hurtado, Casey and Hoffmann, stooped to persistent rudeness and abuse. Arguments alone don’t win public support. People can never even hear arguments they don’t want to hear. And winning the public support is what scares the establishment. See Tim’s post Protecting Our Institutions from “Meddlesome Outsiders”. Who knows, maybe not but also just maybe that may be the way, over time, to get more of those dashed green loops into that diagram above. Posted on 2015-09-05 12:32:55 GMT+0000 by Neil Godfrey. This entry was posted in Biblical Studies, Scholars and tagged Historicity of Jesus. Bookmark the permalink. I suspect the root problem examined here can be boiled down to Paraphrasing Steinbeck ‘Its very difficult to make someone understand something that his salary depends upon him not understanding’. My bad you are correct sir! Where is Hector Avalos in the figure? I saw his name in the who’s who of mythisism, but I have not been able to find anywhere where he writes on the historical Jesus outside “the end of biblical studies”. Would he not he be a prime candidate of a respected scholar who could evaluate the alternative ideas for the origin of Christianity? Avalos is part of the “dashed green loop”. He does not write about the historical Jesus and as far as I am aware you are quite correct to note that his reference to Doherty and the Christ Myth thesis in End of Biblical Studies is his only related public comment. Again as far as I am aware this particular reference has been ignored by other scholars despite their interest in other aspects of his work. Ah sorry I didn’t read the text carefully enough. Other controversial ideas have the benefit of being in realms of scientific inquiry. Evolution, which was viciously attacked for decades and still is in some quarters, has the benefit of being amenable to literally millions of pieces of physical evidence that can be examined objectively. Heliocentricity has obvious physical evidence, as does a round globe. Somewhat less ‘hard’ as science, but still very much amenable to scientific inquiry, are claims about climate change (especially the human-caused bits) or claims about neurobiology (and the fruitless hunt for a ghost in the machine). There’s just enough room for the shadow of a doubt sometimes–and, if you know anything about human psychology, you know that’s all it takes to refuse to believe something that you don’t want to believe. The study of the historical Jesus (and the historicity of Jesus) is not amenable to scientific inquiry. Which is to say, we don’t know the answers. Not only do we not know the answers, but we don’t have the means to start knowing the answers. And it’s likely we never will. All the effort in the world to show something like the non-historicity of Jesus to be ‘plausible’ is going to be fruitless. The hypothetical possibility of being wrong doesn’t shake worldviews. It doesn’t even get people to admit that they might be wrong. Apart from the small minority of people who have very strong commitments to complete honesty and rationality, as well as a strong commitment to personal evaluation of evidence that leaves out considerations of what others believe and approve as a belief, it is far too easy to ignore something’s plausibility. The whole idea of reforming biblical studies from the inside ignores human nature. Taken to its logical conclusion, it would result in the complete dismemberment of nearly all positive opinions about the subject, leaving us only with the grace to admit that we do not know what we cannot possibly know. And that doesn’t fund academic departments or fill academic journals. Neither does it put bread on the table for the lone wolf of a scholar who tries to swim against the tide, given the fact that scholars are cheap, academic appointments are few, and the pressure to conform on a fundamental level, with the idea that the conclusions of biblical studies are both worth knowing and knowable, is strong. Asking someone to get a degree, either to try to publish disapproved ideas that cannot be demonstrated or to try to point that none of it can be demonstrated, is tantamount to asking someone to throw away a lot of money and the best years of their life (and likely with a lasting opportunity cost when trying to succeed in the real world, which views such activity as a questionable waste of time at best). The only thing that is even remotely reasonable to expect of rational human beings with even a dash of self-interest is exactly what has been done–putter around in casual discussion with other human beings, ignoring the academic channels that basically nobody reads anyway (ohmygosh! but that would undermine the power that academics don’t have but earnestly wish they did to control public opinion!). And the emphasis should really be on how bankrupt the whole business is, not to engage in Coke VS Pepsi debates over the flavor of nonsense to prefer. Ironically, furthermore, there is actually very little distance between “mythicists” and “historicists” when it comes to exploring questions of Christian origins. Studying the literary and philosophical relationships between and the development of various ideas within the various sources and attempting to place them in some wider context is already being done without any necessity to introduce an itinerant Galilean preacher into the variables. Most critical scholars already accept the mythical character of the gospels and acknowledge that that’s what is really important when it comes to assessing their place in the larger story. Some people call Vridar a mythicist blog even though most of the posts are taken straight from mainstream scholarship without any or very little reference to the historicity/mythicist question. Can Carrier’s attempt via Bayesian logic be termed a scientific inquiry according to the powers that be (Ehrman etal.) ? Bayes’ Theorem clearly addresses known risks (i.e., probability) but uncertainty? Bayes’ Theorem generally provides a limited approach to modeling uncertainty based solely on expected risks (e.g., white swans) without accounting for unexpected risks (e.g. black swans). That’s probably good enough for most situations, though. Leaving that quibble aside, I’d answer Stephen’s question by saying that the “powers that be” are not interested in a scientific inquiry nor would they know one if they saw it. On the other hand, I would like to think that any scientist would recognize that someone trying to apply Bayesian logic is attempting to engage in a scientific inquiry, but I don’t know that they’d necessarily agree that Carrier successfully pulled one off. I don’t know what you mean by “we don’t have the means to start knowing the answers”. Our questions can only ever be explored to the extent we have data from which those questions arise. Do you mean we don’t have the data to work with in order to make our question anything more than a speculative “Does Santa/the Tooth Fairy exist?” This is why I sometimes prefer to say that the only real historical question is How did Christianity emerge? And if that can be answered with existing data without any need for an HJ then so be it. And if the probabilities given our data point to no real need for a HJ, then if that’s as far as we can go, then is that not the same status of knowledge we have for many other questions in history and our cultural myths? I mean that we are getting some banal answers, remotely connected to whatever the “origin” point of Christianity is, that can be considered knowledge. For example, was there a guy named Justin, maybe even a Martyr? Check. But that’s not what burns a hole in the wallet of the interested public trying to find perhaps the most interesting answer to most people. For a lot of people, that question involves variations on: did a historical Jesus exist, or did Christianity emerge in the absence of a historical Jesus as part of its origins, and if so how? For a lot of other people: And, if so, what can we say about him? There is intense interest in this ultimate origin point, where we can capture the moment in time that something about “Jesus” emerged onto the human stage and understand exactly what that was all about. That’s exactly what we don’t have the means to start *really* knowing the answers to–I’d actually say that it’s very much *more* speculative than the existence of Santa and the Tooth Fairy, precisely because of the presence of so much just-ambiguous-enough “data” (almost entirely copies of copies of texts from ancient times non-contemporaneous with that interesting origin point) that has this chimera-like ability to change shapes if you’re willing to accept *any* less-then-very-firm answers, beyond the completely banal examples like the one above… e.g., that a guy named Justin or Tertullian or Eusebius was around and scribbling, a long time later. Start speculating, and you’ll got a whole lot of ideas but not a lot of real knowledge. This problem becomes acute enough to be declared a bust when going far back enough to interest the masses. In retrospect, Santa and the Tooth Fairy (lifted from your reply) are really terrible comparison points (for my purposes), because they are classically referenced as things that children grow out of because they sense the contradictions or see the empirical evidence that their parents are pulling the strings. They are simple examples of ‘known myths’, as simple as they come. As far as speculation goes, something like “a historical fill-in-the-name-of-some-mythical-seeming-person-in-the-pre-600-period-who-has-no-positive-evidence-against-but-not-a-lot-for-either.” For example, a historical Odysseus. That’s speculative and difficult to dig anything up on. “Jesus” is also very speculative, for all the same reasons but even more-so *because of* that whisper of ‘evidence’ (whatever you want to call it–if it has to be torn down at great length to make people see the ambiguity in the subject, give it the dignity of being called a whisper) in favor of his historicity, moving it even closer to utter confusion, ambiguity, and the absence of real knowledge. Interesting cutoff at 600BCE. Do you consider the hystoricity of, say, Pythagoras or Epimenides in a better shape than that of Jesus? I would say that if an hystorical Odysseus provides a lower bound to the probability of Jesus existing they could provide an upper bound, while still nothing about them is known with any certainty. I would say that I have enough doubt not to be sure about the historicity of Pythagoras, Jesus, or Siddhartha (but not necessarily non-historical either). The issues involved are different in each case and don’t lend themselves very easily to a “hierarchy of historicity,” least of all one that we can easily establish and reference as a shared standard. In the long run, though, I think we could benefit studying ‘myths’ closer to modern times (such as Ned Ludd), so that we can get some kind of theory built up (maybe) around non-historical people that end up being popularly referenced as historical. Extant record-keeping is just too spotty for most of ancient history to use it for that kind of theory-building work. Regarding Gautama, I think there the data is all dearth. We can only guess what in the canonical sources might have actually happened, with nothing solid to stand on. Jesus is more interesting because reliable sources are just starting to come online, so there’s just enough available to whet the appetite while still leaving most questions unanswered. Is it any different to most people than what I imagine the questions of the historicity of Robin Hood or King Arthur are? Obviously these don’t have the same wider cultural clout as Jesus but many of us are capable and content to live not knowing for sure if such figures had a historical basis. (Scholars may have more clear-cut views but that’s beside the point, yes?) If information comes our way raising questions about the historicity of these figures many of us might stop to listen, even more so for Jesus because of his wider cultural significance, but could walk away quite happily despite these doubts. What irks me when I come face to face with it is the hypocrisy and unprofessionalism of a number of prominent academics — public intellectuals abusing their status — when they address the fact that there are outsiders who question their methods and conclusions. By “most people” I meant “most people [in the subculture of people who are interested enough to buy books about the subject],” not in any absolute sense. I guess I should also add that by “most interesting answer,” I also meant the “most interesting answer [in this particular field of study],” again not an any absolute sense. I would think only a small minority involved would actually rate it as their most interesting subject or cause or ‘answer’, which I guess for most people would involve some kind of political issue. I am sure I am taking the easy way out in all of this. I see no reason (or more strictly “not enough reason”) to work with the proposition of a historical Jesus in any of the questions that interest me. In fact the data that do interest me do not, as far as I can see, require a historical Jesus to explain anything. So from my perspective the question does not arise. I am quite open to an HJ (at least I like to think I am) being found to be necessary to answer the questions I have. Of course none of that means there was no HJ. It’s just that I believe the gospels themselves are best explained on other grounds. And who knows what Paul’s letters originally looked like? Funnily enough I think I could sail through a theology course and even get a PhD without ever once having to address the historicity of Jesus and never needing to appeal to his historicity in any study of the origins of our earliest Christian documents. But if I ever did “meet” Jesus in those studies then, Wow, I’d be thrilled that there was a sure and certain reason to “believe”! 🙂 I’m sure my arguments would be a great sensation and I’d make a name for myself if that ever happened and I’d be knocking back invitations to speak at all sorts of believers’ and others’ meetings. I might even be able to charge like Ehrman. I read a book or two about King Arthur when I was a kid, and none of the authors would have got in-your-face about needing to believe in his historicity on pain of being called names and thrown out of the conversation. They noted the evidence, the doubt, and then moved on to the subject of the mythology, about which a lot more can be said. Long time reader, first time poster. That remark pulled me up in the debate. Why is it seen as an attack on HJ when non academe atheists are interested in the topic, when its “an interesting topic”? Its like he’s created his own confirmation bias to confirm his biases. Its sad because I’ve enjoyed his blog in the past. So full disclosure, I’m an activeish “internet atheist” who is just about in the historicist camp but I have splinters from the fence. It would take very little (compelling evidence) to make me jump either way, and that’s why its such an “interesting topic”. Congratulations on coming out and posting, Gareth. Yes, there are several places where DG says one thing only to reverse gears and say something akin to its opposite not long afterwards. My interpretation of this is that he is struggling to integrate what he can see for himself and what he knows is the correct line to follow in his chosen field. Ironically in some ways it reminds me of my slow step by step progression to entering a religious cult many years ago. Not that academia is comparable to a religious cult, of course, but the process of taking on the new frame of mind and outlook and forsaking the old is comparable. Chomsky has spoken about the same process. Members of the journalistic guild, for example, are free to say whatever they like, but to get into that position in the first place they must prove they will say the right things within the acceptable parameters in order to be accepted. It will be interesting to see what the Daniel who comes out with his Masters and then PhD will be like compared with is budding 26 years now. I have bench splinters myself, Gareth. I think it’s important to add, though, that since for us atheists this isn’t by any means a life or death question, we can go back and forth on the subject. I really don’t mind arguing it both ways, and I’m also comfortable saying that the very lack of information leads me to withhold judgment on the matter. In other words, it isn’t as if we’re trying to decide which color wire to cut on a ticking time-bomb. It’s a historical curiosity, not a question that demands an immediate answer. I mention this, because it often seems that those on the historicist side of the debate project their angst, dogmatism, and hostility onto the mythicists with whom they’re debating. I can easily imagine finding information that proves Jesus existed, showing it to Neil and having him say, “Oh, cool.” And his life would not have been changed in the least. A PhD is more of an indicator of how long you’ve spent in university than how competent you are in a subject area. An amateur can be competent just as a Doctor can be incompetent. It depends a great deal on the field of study. There is a vanishingly small number of people who could ever become competent armchair astrophysicists. But I think with enough reading over the course of decades, one can become reasonably competent in history. The academic environment has tremendous advantages, not the least of which is being able to bounce ideas off other like-minded experts in person. I know from my own field of work that when you put two engineers in a room, the whole is often much greater than the sum of its parts. That said, the problem of incompetence is around us everywhere, at all levels . . . unfortunately. And one reason that it won’t go away is that people are reluctant to point it out. The number who could ever must be in the hundreds of thousands. An IQ two, three, or even four standard deviations (3 sd = 1 in 407 people = 783,000 people in the US alone; 4 sd = 28k in US) above the mean opens a lot of books in self-directed study. So this is meaningful if giving advice to someone of average intelligence, less meaningful if talking about spotting people “in the wild” doing this kind of thing, which you can expect to happen (if the training doesn’t require extensive access to expensive equipment, etc. and can be obtained from books). Those attracted to completing an advanced astrophysics degree have self-selected themselves for high IQ. Of course, yes, education and collaboration helps in many ways other than just mastering the book learning. As someone in grad school, I can tell you that a PhD is more about learning how to do good research over being an expert. If expertise was the only metric, then we could just be awarded doctorates after passing the qualifying exams. Which is better: Jesus as myth or Jesus as fan fiction? Daniel admits that Biblical Jesus, the Christ of faith, is fiction, which makes the “reconstruction” that is Historical Jesus fan fiction. I really don’t understand why people feel the need to cling to the idea that Jesus was an historical figure. The desperate drive to salvage Jesus’ historicity seems far more illogical than just admitting that you don’t know if Jesus was historical or not. Those seem to be the two real choices we have based on the evidence: either there was no historical Jesus or we just don’t know. That’s a significant quote of DG’s that I should have addressed. It establishes a clear boundary between how biblical scholars define themselves and outsiders. And it clearly establishes that the HJ is taken for granted just as much as the round earth. If you challenge the HJ you are aligned with flat earthers. The issue here may not be between the mythical Jesus and the historical Jesus, but rather what function the New Testament writers were trying to serve in writing the way that they did. To take one example, the author of the gospel of Matthew presenting Jesus as “The New Moses” may have been an excellent selling point to potential “Learned Jew” converts: Jesus as the fulfillment of Scripture. This isn’t a positive argument for a Jesus that actually existed, though. Yes, it could be that there are double meanings and that those double meanings do not preclude an historical Jesus, by itself. I think Carrier would agree with that point. The problem is the lack of evidence outside of these stories as separate stream of evidence. Added to that problem is the absence in Paul’s writings of any clear positive evidence for an historical Jesus. Added to that is Paul’s positive statements about his view and knowledge of Christ as a person discovered in scripture and revelation. It is of course possible to pick at any one piece and there is certainly no smoking gun either way. Carrier actually considers the Gospels neither here nor there for establishing a case one way or another. The most irritating argument from the HJers is that anyone who doubts that Jesus Christ was an actual person in history does so because they just don’t like Christianity. I have no such problems with Christianity or theism in general. I personally do not see any evidence for the existence of supernatural deities. That in no way means there could not have been a person on whom the Jesus Christ myth was based (the myth is there and pretty well agreed upon by all sides, the question is whether that myth that we see was based on a real person). There’s no gain for people who don’t believe in supernatural beings one way or another. It could be argued that Jesus as an actual role model is a very power, progressive force in society, with no appeal to his divinity.